Pumping water, even in large quantities, without energy costs and with a pump that runs off solar power. It was only in the 1970s that photovoltaic solar cells able to transform solar power into electric power were first successfully used. This technology involves only low maintenance costs (generally limited to cleaning the pump) and requires no outside fuel supply (petrol, electricity). The photovoltaic system’s service life is also a relatively long one (20 years), longer than that of the pump itself (often less than ten years). This technology is especially suited to rural environments in Africa’s Sahel area. This is because sunlight is plentiful (with over five hours a day of maximum sunlight), underground water resources are plentiful, the isolation of rural villages often makes it difficult to supply them with conventional energy supplies (petrol, electricity) and the need for water is low enough that it can be covered by solar pumping. Solar water pumps are pumps that work with an electric motor whose power comes from photovoltaic cells located on solar panels that capture power from the sun’s light. These pumps are often directly connected to a tank supplying a miniature water network or standpipes. The pumps used are generally centrifugal force or suction-force pumps. 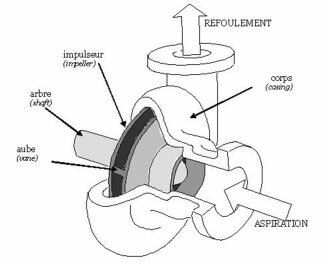 The fluid is sucked in axially, due to the rotation effect of the impeller, into the pump body where it is radially accelerated in the vane before being forced out. The shaft is driven by an electric motor. What is the “photovoltaic effect” ? This is the direct transformation of light power into electric power thanks to photovoltaic cells. These are made from silicon with a purity and state (mono-crystalline, poly-crystalline, amorphous) that strongly influence the efficiency and cost of the cell. These cells are connected together and placed on solar panels. There are different types of motors, DC or AC motors, and within each of these categories there are still more choices. Among DC motors, electromagnetic winding series motors are best suited to variable pumping capacity applications depending on sunlight. However, more and more often AC motors seem to be chosen for pumping using photovoltaic power (for these are low cost motors with enhanced efficiency thanks to the solar rectifiers used, which despite their extra cost, are worth it). 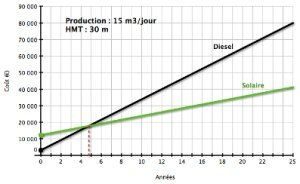 - A “Pump with the sun” system, the one most often found, where a tank serving as the reserve is combined with the pump for batteries are expensive and rarely last longer than two to three years. This aspect requires calling in specialists and consequently their presence nearby. Maintenance is fairly simple and not very costly. It is necessary to ensure that there is a pump or water point management committee, or one needs to be created, so as to ensure proper use, follow up and safety for the installation, especially to limit the significant theft or damage hazards. The optimum cell power level is almost proportional to the light that it receives. The maximum lighting is 1kWh/m2. The maximum sunlight hours are therefore a major criteria when it comes to sizing photovoltaic systems. Daily sunlight values are often stated in the form of monthly averages for latitudes and inclines at a given location. Sunlight intensity is maximal when the panels are inclined so that they are placed perpendicularly to the sun’s rays. Ideally, the panel incline angle should be continually varied throughout the day. From a practical point of view, the amount of sunlight captured annually is maximised if the panels are inclined at an angle that equals that of the latitude. The usage temperature also impacts solar cell performance (especially in voltage terms). This results in a loss of efficiency of some 0.4%/°C (the curves showing the characteristics of these systems are often produced at 25°C). It is possible to adapt the voltage and/or current produced by a photovoltaic system by making connections in series and/or in parallel between the photovoltaic cells to form what are called photovoltaic modules, more often known as solar panels. WARNING : This kind of combination must be done carefully (after an in-depth study of the module and its usage environment) to avoid permanently damaging the cells. 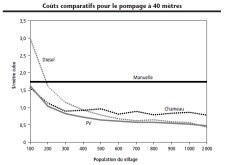 For further information on sizing a photovoltaic system without a battery, please refer to Chapter 7 in the second part of the following work (full references are provided at the end of this Factsheet) : Le Pompage Photovoltaïque – Manuel de cours à l’intention des ingénieurs et des techniciens (Photovoltaic Pumping - A course manual for engineers and technicians). - These pumps run off a clean, plentiful and free renewable energy source. - The maintenance cost of solar panels, that have a service life of at least twenty years, is practically nil. The investment cost is a high one (but it will probably tend to fall in time). The installation requires precise prior study work and specialists, who are still few in number. Lastly, the efficiency of these pumps varies in line with the amount of sunlight, the panel exposure angle and temperature. The theft hazard is a major one, with one company (Vergnet) proposing to install the panels on six metre high masts. Their batteries store the power produced by the cell during sunlight periods so as to be able to return this power when needed to run the pump, unfortunately such batteries are costly, not very durable and require plenty of maintenance and may also lead to a 20 to 30% loss in efficiency, which seriously limits the usefulness of this solution. This solution is a reliable one that is cheaper than the former one, but these pumps do not supply constant amounts of water and will not operate until a certain level of sunlight is achieved (notably at the start and the end of the day). As their efficiency is less outside of their rated operating power level, a load adapter needs to be fitted. 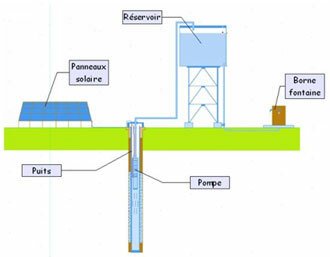 In this example a solar pump of average size is installed in an area benefitting from good sunlight (5.5 kWh/m2/day), for a daily water volume of 15 cu. metres serving a population of 1,200, so that the cost of the water, per cu. metre, came to $0.41 in 1998. 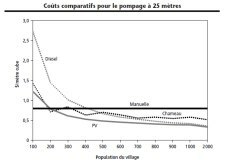 2) In the extreme south of Madagascar, in 2004, equipping old wells and drillings with solar powered pumping and water potabilisation installations, for 18 villages (17,500 people) cost €515,000 in total, or €30 per person. 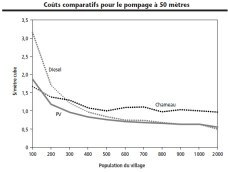 3) In Senegal, in 2007, installing a complete water network in a village called Diabal with a population of around 1,000 habitants (a 70 metre deep drilled well, a solar pump, a storage tank, 3 km of pipe, 6 drinking fountains + creating a market garden cooperative) cost €46,000 in all. 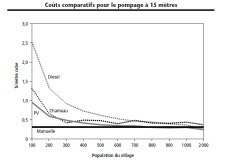 4) Example of unit price quoted by a company (Vergnet) that installs solar pumps, placing the solar generators on masts approx. 6 metres high to avoid frequent theft and damage issues. The cost was some €3,500 per system allowing the production of 1,000 Wc (+ approx €1500 per kit in lifting to install a number of generators and the related work (lifting arm, mountings and fittings). 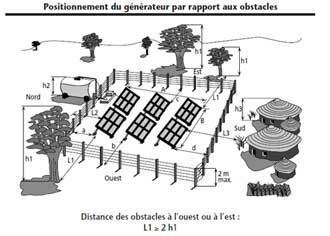 Here is an example of a possible layout for the photovoltaic generator, again according to Le Pompage Photovoltaïque – Manuel de cours à l’intention des ingénieurs et des techniciens (Photovoltaic Pumping - A course manual for engineers and technicians). To ensure that the solar pump is a durable solution, it is absolutely essential that the community organise to take on the cost of bringing in outside specialists should the system fail as well as the regular pump operating costs. 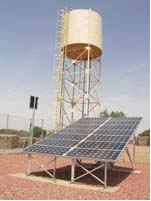 - That of NGO Aqua Viva who as of the 1990s, had installed 300 solar pumps in Mali, which are still in operation. 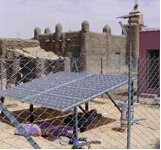 - That of Fondation Veolia (see photograph opposite in Mali), that since 2007 has paid for a number of water supply installations using solar powered pumping in numerous villages, especially in Burkina Faso and Mali, with the specificity that they have been able to achieve the carbon certification allowed for under the Kyoto protocol, given the reduction in greenhouse gasses achieved. - PSEau (French solidarity Program for Water) "Pompage solaire: un guide pour mieux comprendre cette option"
- ADEME (French agency for the environment and energy management) : An illustrated 48 page manual called “La production d’eau potable avec une pompe photovoltaïque” (Producing drinking water using a photovoltaic pump) that properly describes the principle and mode of installation and operation. - You Tube:A 6’ video called Solar Water pumping system installation in a water well showing how to install a solar pump in a well - Rubinson Pump, total cost €1,300. 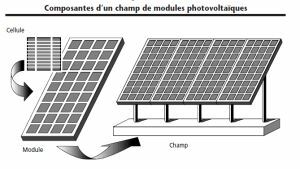 - Title : Le Pompage Photovoltaïque – Manuel de cours à l’intention des ingénieurs et des techniciens. Authors : Directed by Eric SCHILLER ; Written by Jimmy ROYER, Thomas DJIAKO, Eric SCHILLER and Bocar SADASY. Publication : 1998. 254 pages. ISBN 2-89481-006-7. 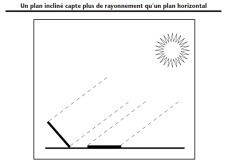 - Title : “Le guide pratique d’installation du solaire photovoltaïque à l’usage des techniciens et ingénieurs”. Author : Jean-Paul Louineau. A 150 page manual published by Eyrolles.